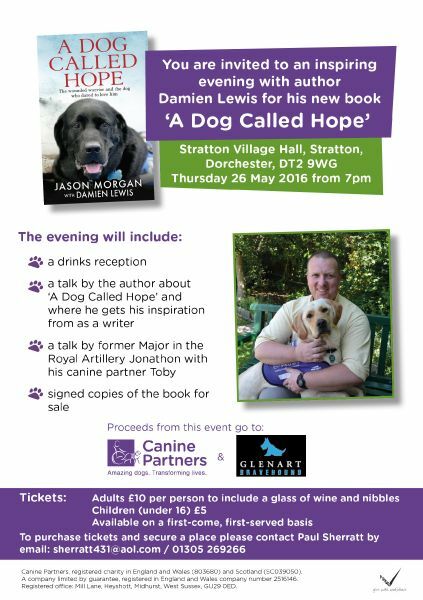 Prestigious author Damien Lewis invites you to celebrate his new novel ‘A Dog Called Hope’ at a book launch – and is supporting two charities in the process. The ticketed event will take place at Stratton Village Hall, in Stratton, Dorchester, on Thursday 26 May from 7pm. Damien, the number one selling author of The Nazi Hunters and Zero Six Bravo, will give a talk about the book, where he gets his inspiration from and will be signing copies of the book at the evening reception. ‘A Dog Called Hope’ is an inspiring read about how assistance dog Napal enabled American Special Operations soldier Jason Morgan to rebuild his life, reconnect with his family and to find true peace against the odds. Jason was left paralysed by an anti-narcotics mission that went badly wrong, his wife left him and overnight he became a paraplegic father with three young boys to raise. He had lost the two things which defined him: his military service, plus his family and marriage. Battling depression and wheelchair-bound, Jason heard about the American not-for-profit organisation Canine Companions for Independence, and made the life-changing decision to get one of their service dogs for wounded veterans. All proceeds from the inspiring evening will go towards helping two charities; Canine Partners, which provides assistance dogs for service personnel and civilians with physical disabilities, and Bravehound, which provides training and dogs to support veterans. Former Royal Artillery soldier Jonathon Giemza-Pipe will give a talk during the evening about how his life has changed since being matched with canine partner Toby in July 2014. Jonathon has a spinal injury and says Canine Partners has transformed his life. The book ‘A Dog Called Hope’, which has so far reached number 12 in the UK Bestsellers Book Chart, is in development with LA-based Safran Films (The Choice, The Conjuring) with screenplay by Richard LaGravenese (The Horse Whisperer) and agented by Luke Speed (Curtis Brown). Tickets to the launch evening are £10 for an adult, which includes a glass of wine and nibbles, and £5 for a child under 16. To purchase a ticket and secure a place contact Paul Sherratt by email sherratt431@aol.com or by calling 01305 269266.